A solution of salt and water used as a soaking medium for whole turkeys for the purpose of moistening the meat and enhancing the flavor. The brine breaks down and extracts some of the proteins from the meat, which allows liquid to be absorbed into the turkey. When the turkey is cooked, the proteins coagulate, preventing the absorbed liquid from escaping; therefore, brining helps to ensure that the turkey will remain moist throughout a lengthy roasting period. 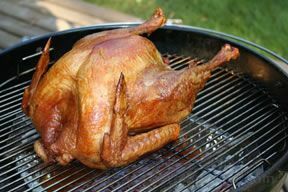 The flavor of turkey meat that has been brined is often slightly saltier than turkey that has not been brined, but the meat is ultra moist. 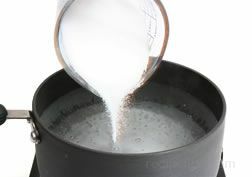 In general terms, a ratio of 1/2 cup table salt to 1 gallon of water or 1 cup kosher salt to 1 gallon of water is used to make the turkey brine. Kosher salt is lighter than table salt, which is the reason that a larger amount is required. Kosher salt is often preferable to table salt because it doesn’t contain the additives that are found in table salt. The salt must be completely dissolved in the water before the turkey is placed in the brine. Other flavorings, such as herbs, spices, or sugar, can be added to the brining solution if desired. 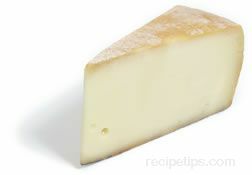 The brining solution must be discarded after use: It cannot be used again. After the turkey has soaked in the brine for the necessary time, it is rinsed and dried. 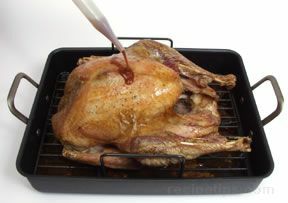 Thorough drying of the turkey ensures that the skin will be crisp and golden when the turkey is roasted. 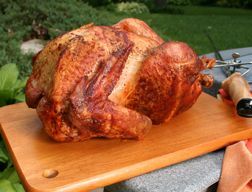 It is important to remember that a brined turkey will cook faster than a turkey that has not been brined.